Somewhat improbably, Carpentier appears in a work of art by Irish/British painter Francis Bacon (1909-1992). The work in question is a curious piece, one of several works on paper by Bacon owned by the Tate Gallery that consist of loose pages from a book on boxing overpainted in oil. In “Georges Carpentier,” Bacon takes a page with a photograph of Carpentier standing over Joe Beckett, stretched out at his feet. There is a legend above the photograph: “Carpentier: Bogeyman to British Heavy-Weights,” and one below: “Joe Beckett vs. Georges Carpentier.” Bacon has painted a sort of frame around Carpentier with broad black strokes; within that frame, he has painted what appears to be a sort of shadow figure of a boxer, intersecting with, but not obscuring, the photographic image of Carpentier. Carpentier’s legs are overpainted with black lines clearly meant to represent legs and feet; at about waist-level, the painted figure is turned to the side and bent forward somewhat, so as to leave the photograph of Carpentier visible and recognizable. The painted figure of the boxer is reminiscent of Bacon’s other representations of boxers, typically quite abstract. 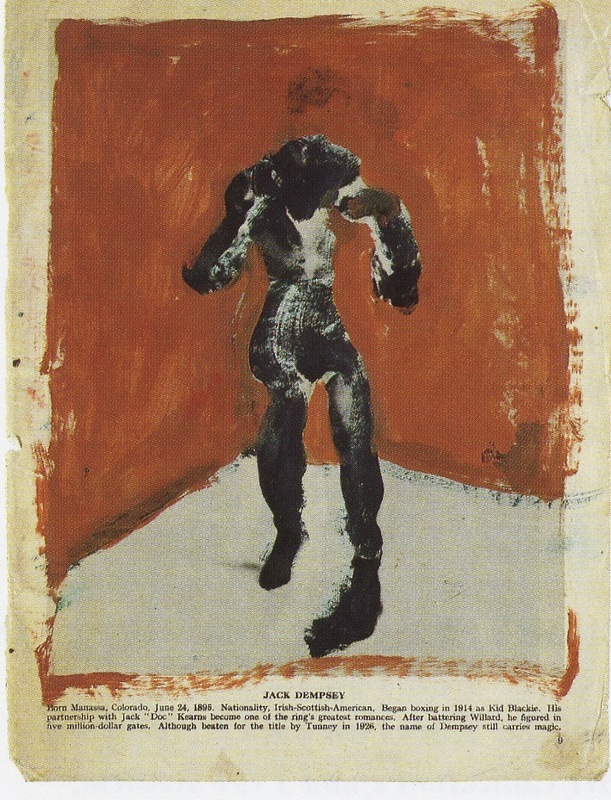 It is interesting to note that one of Bacon’s other works of this type, also in the series owned by the Tate, represents Jack Dempsey; in that instance, the photograph on the page is entirely overpainted; the result is a brick-red background, a gray-white foreground and figure of a boxer in black in the center. The figure is more or less abstract, without any distinctly rendered facial features and very schematic anatomical ones, but its pose manages somehow to be nonetheless clearly evocative of Dempsey (the painted figure is no doubt an abstraction of the photographic image over which it is painted). It is difficult to know what to make of these works. At least one scholar, Andrew Brighton, emphasizes what they reveal of Bacon’s relation to photography: “Grounded in the use of photographs, Bacon’s skill as an image-maker derived from depictions of bodies in motion. […] Bacon learnt to draw from copying and working on lens-derived images. The revelation after his death of his works on paper confirms his debt to photography. He drew with a brush and scratched on photographs in a way that summarizes posture and movement.” Brighton chooses the Carpentier piece as the illustration of his point. Another Bacon scholar, Matthew Gale, discusses the interest boxing matches represented for Bacon in terms of both content (the “victor and the vanquished,” as in the photograph of Carpentier) and form (multi-figure composition, the geometry and lighting of the ring and so forth). David Alan Mellor discusses the artist’s various boxing images, including the overpainted ones, in the context of Bacon’s fascination not only with corporeality and movement, but with masculinity, violence, masochism and mutilation. As far as the choice of the Carpentier image is concerned, it may be tempting to argue that Bacon was drawn to it because of its anatomical and/or symbolic interest, as a depiction of two male bodies in a certain spatial (one standing, one fallen) and psychological (one triumphant, the other defeated) relation, rather than as a representation of any specific historical figure. Bacon would indeed appear to have been less interested in the specifics of boxing history than in the esthetic and “primal” aspects of the sport. 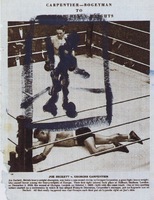 That said, he was clearly interested on some level in the notion of celebrity as well: in addition to boxers, photographic images of other iconic male celebrities were among his working documents; the Tate series includes an image of Dempsey and two of Joe Louis in addition to the one of Carpentier and a comparable series in the Barry Joule archive features images of champions such as La Motta and Walcott. He also seems to have been interested in sport per se: his working documents include images of men engaged in various sports other than boxing, especially cricket. All of this raises questions about the notion that Bacon’s choice of an image of Carpentier may have been based on purely formal grounds. Bacon was born in 1909; as a twelve year-old boy in Ireland, there is no doubt that he heard lots of talk and no doubt saw pictures of the Carpentier-Dempsey fight. Perhaps those images were at the origin of his fascination with the ring. When he moved to London in 1926, a Carpentier was still very much a celebrity in England. Little wonder, then, that one of the figures to whose image he was drawn was Georges Carpentier.